Glory have announced Hayabusa as there new sponsor. Hayabusa will be the Official Glory sponsor and all of there competitors will wear Hayabusa’s new lace gloves during there fights. The ring will also have there Logo on it. This is an exciting moment for Hayabusa and we are proud to be working with such big organisation who we believe have a lot of drive just like ourselves. Hopefully this partnership pays off and we both help each other continue to grow. New York, NY – GLORY, the world’s premier kickboxing league, today announced Hayabusa as its official in-ring glove, signing a multi-year equipment deal. 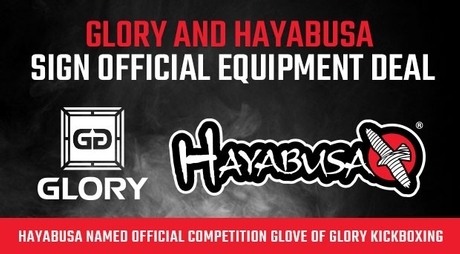 Beginning on Friday, August 7 with GLORY 23, from The Joint at Hard Rock Hotel & Casino Las Vegas, all GLORY competitors will be outfitted with Hayabusa’s new World Class Competition Gloves. Featuring exclusive technological advancements specific to Hayabusa, the soon-to-be-released gloves were designed to complement the arsenal of GLORY’s top-level strikers. “The name Hayabusa is well-recognized by the world of combat sports as the ultimate in performance equipment and technical apparel,” said GLORY CEO Jon Franklin, who helped broker the deal. Hayabusa’s World Class Competition Gloves will be officially revealed to the public for the first time during fight week of GLORY 23 and used in each subsequent event, including the newly announced “Bellator: DYNAMITE” event on Saturday, September 19. “Hayabusa is extremely proud to be partnering with the most exciting promotion in combat sports today. The high-caliber level of striking that GLORY brings is truly outstanding and we couldn’t be more thrilled to be part of it,” said Ken Clement, Co-President, Hayabusa. Stay tuned for more details on the Glory sponsor and Hayabusa partnership.